The average baby activity gym is a large, cumbersome and bright-colored plastic plaything, which often takes up residence in your living room for months on end. Hello eyesore! Plan Toys Baby Activity Gym on the other hand is minimalist, wooden, and collapses so you can easily stash it under the couch or in a closet after playtime is over. 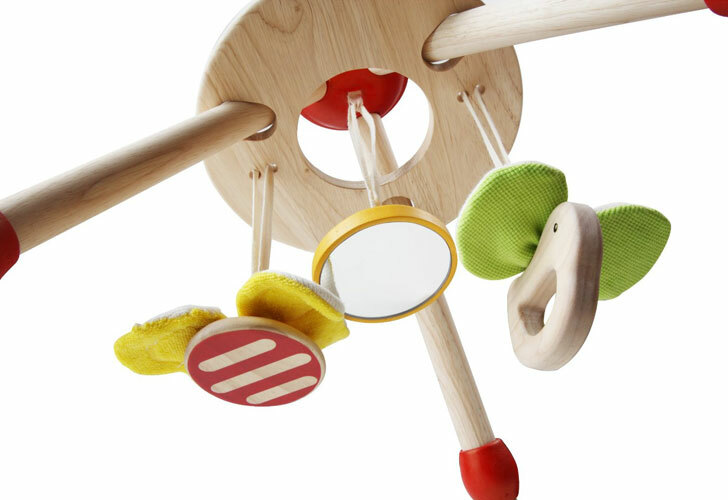 The mirror, rattle, and bird and bee grasping toys make it equally engaging however. Plan Toys is one of our favorite eco-friendly toy makers – their offerings are made from renewable rubberwood and non-toxic paints and finishes. The average baby activity gym is a large, cumbersome and bright-colored plastic plaything, which often takes up residence in your living room for months on end. Hello eyesore! Plan Toys Baby Activity Gym on the other hand is minimalist, wooden, and collapses so you can easily stash it under the couch or in a closet after playtime is over. The mirror, rattle, and bird and bee grasping toys make it equally engaging however. Plan Toys is one of our favorite eco-friendly toy makers - their offerings are made from renewable rubberwood and non-toxic paints and finishes.